Tambor Class Submarine: Laid down, 5 July 1939, at Portsmouth Naval Shipyard, Kittery, ME. 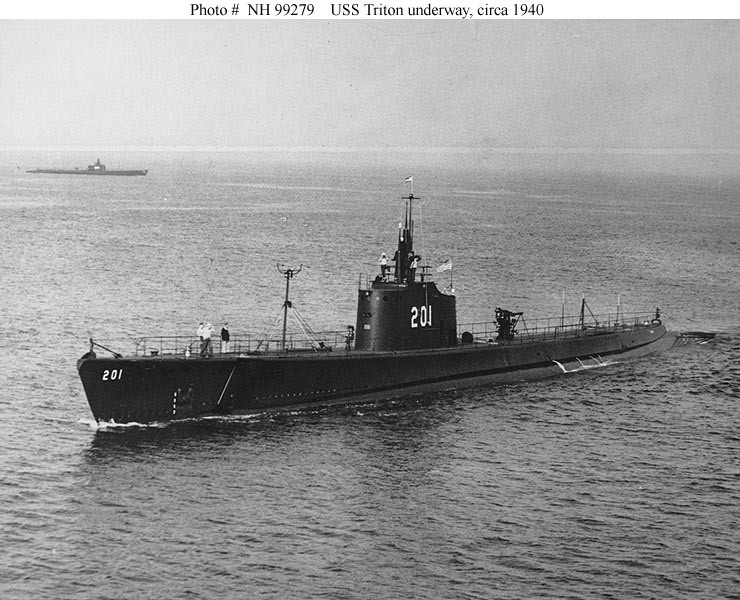 ; Launched, 25 March 1940; Commissioned, USS Triton (SS-201), 15 August 1940; Triton was reported overdue from patrol and presumed lost, 10 April 1943. Post-war examination of Japanese records revealed that on 15 March 1943, three Japanese destroyers attacked a submarine a little northwest of Triton's assigned area and subsequently observed an oil slick, debris, and items with American markings. Triton received five battle stars for World War II service. Specifications: Displacement, Surfaced: 1,475 t., Submerged: 2,370 t.; Length 307' 2" ; Beam 27' 3"; Draft 13' 3"; Speed, Surfaced 20 kts, Submerged 8 kts; Max. Depth Limit 250'; Complement 5 Officers 54 Enlisted; Armament, ten 21" torpedo tubes, six forward, four aft, 24 torpedoes, one 3"/50 deck gun, two .50 caliber machine guns, two .30 caliber machine guns; Propulsion, diesel-electric, four General Motors diesel engines, 5,400 hp, Fuel Capacity 93.993 gal., four General Electric motors, 2,740 hp, Battery Cells, 252, two propellers. 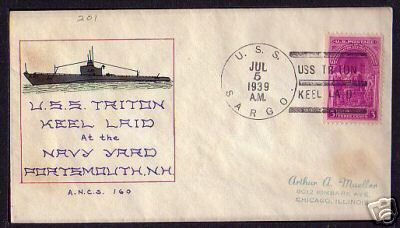 22k Commemorative post mark on the occasion of Triton's (SS-201) keel laying, 5 July 1939, at Portsmouth Naval Shipyard, Kittery, ME. Courtesy of Jack Treutle (of blessed memory). 514k Triton's (SS-201) launching party. Photo courtesy of Wendy S. Gulley, Archivist Submarine Force Museum, Naval Submarine Base NLON Groton, CT.
142k Commemorative post mark on the occasion of Triton's (SS-201) launching, 25 March 1940. Courtesy of Jack Treutle (of blessed memory). 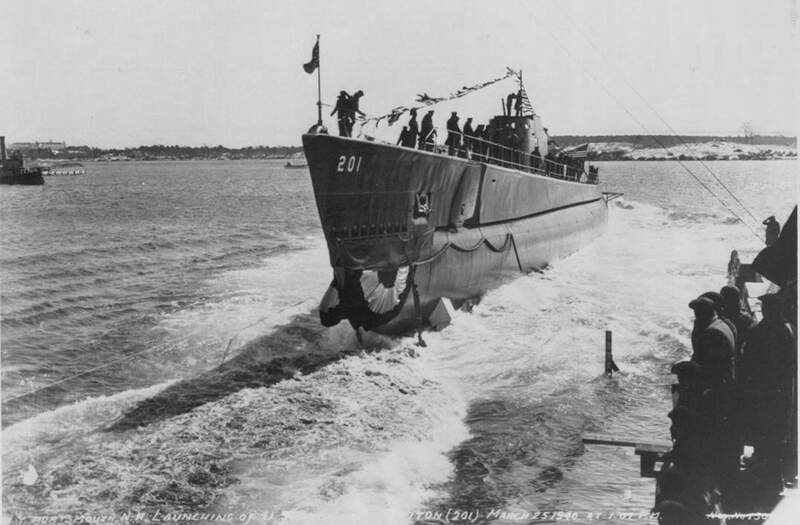 206k Triton (SS-201) slides down the ways at the Portsmouth Naval Shipyard, Kittery, ME., 25 March 1940. USN photo courtesy of ussubvetsofworldwarii.org. 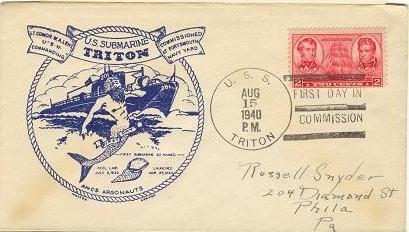 24k Commemorative post mark on the occasion of Triton's (SS-201) first day in commission, 15 August 1940. Courtesy of Jack Treutle (of blessed memory). 98k Cast iron model of the Triton (SS-201) and Shark (SS-174) class submarines. Photo courtesy of John Shane, whose grandfather, Lieutenant Commander Louis Shane, Jr. was lost at sea while commanding the Shark (SS-174), approximately 11 February 1942. 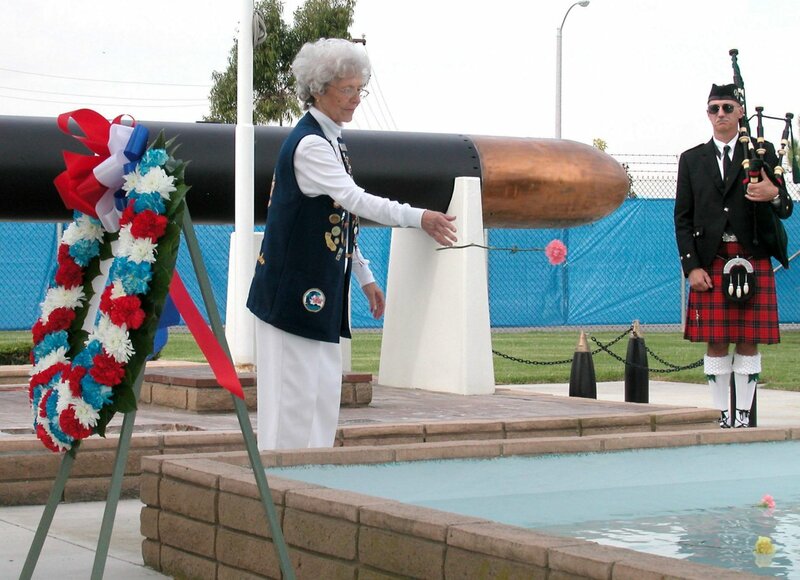 Secretary of the Navy Knox (near bow) threw a wreath over the side of Navy submarine Triton (SS-201) yesterday while a bugler blew "Taps" as funeral services were held at sea for 33 officers and men lost aboard the submarine O-9 (SS-70). Note the flag at half mast. A. P. Wirephoto. Photo from Evening Star. [volume] (Washington, D.C.) 1854-1972, 23 June 1941, Image 8, via chroniclingamerica.loc.gov. Note: YN1 Loyal Day was a plankowner of Sealion and aboard when she was bombed on 10 December 1941. Courtesy of Ric Hedman. 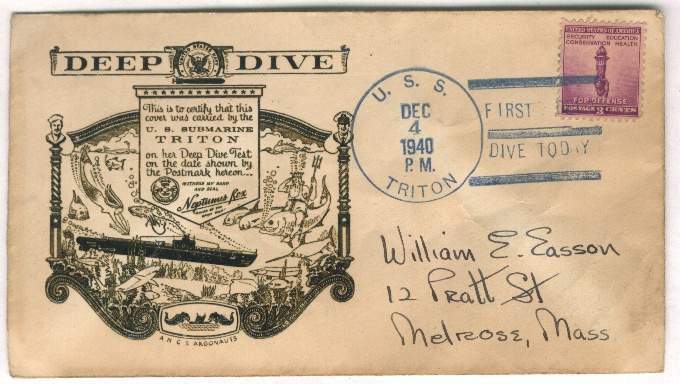 46k Commemorative post mark on the occasion of Triton's (SS-201) deep dive, 4 December 1940. Courtesy of Jack Treutle (of blessed memory). 111k Triton (SS-201) underway at sea, circa 1940, seen from a blimp. 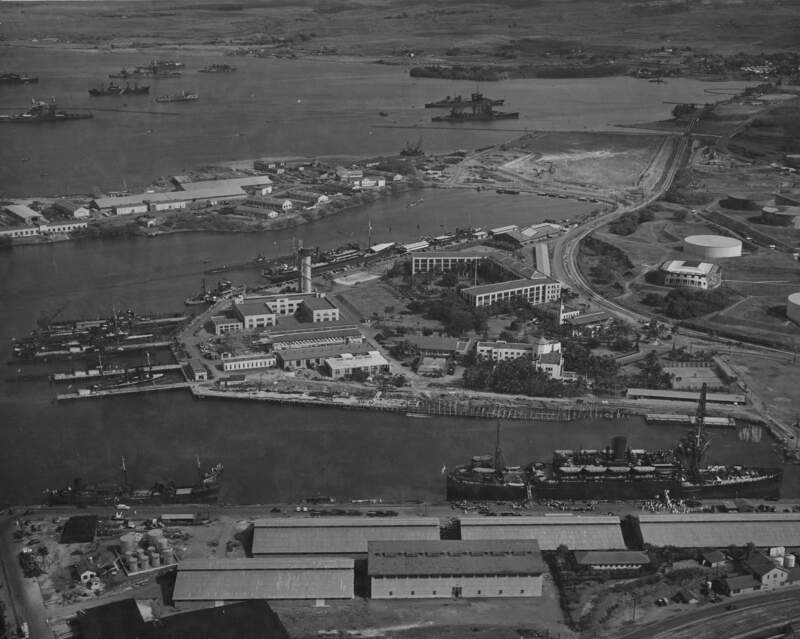 Photo dated July 1943, but taken about two or three years earlier. High aerial view, taken from off Triton's port side, forward. Her bow is cropped out of the view, and her after portion is somewhat obscured by the blimp's engine and its supporting structure. Triton is in pre-war configuration, with the "201" painted on her sail in large numerals. USNHC photo # 80-G-42357, submitted by Bill Gonyo. 229k An American Submarine Teaches a Blimp the Tricks of Hitler's U-boats. 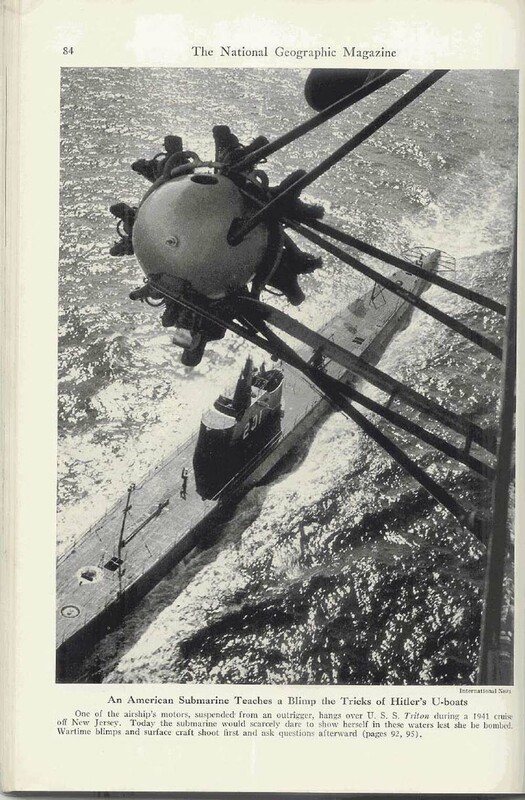 One of the airships motors, suspended from an outrigger, hangs over the Triton (SS-201) during a 1941 cruise off New Jersey. Today the submarine would scarcely dare to show herself in theses waters lest she be bombed. Wartime blimps and surface craft shoot first and ask questions afterword. Photo courtesy of International News, from the the 1941 edition of National Geographic Magazine, page # 84 & submitted by Ron Reeves (of blessed memory). 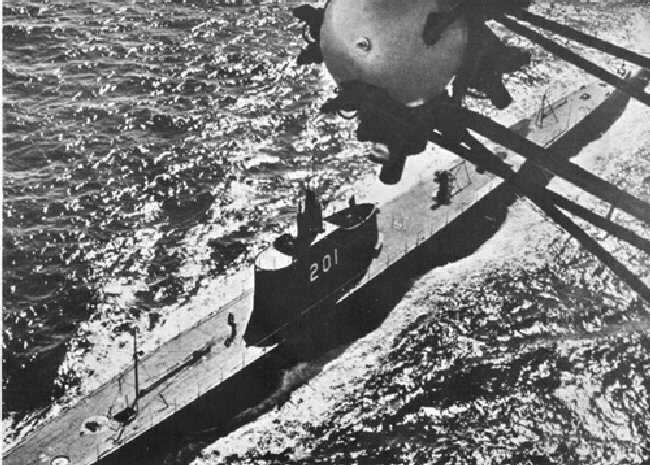 100k Triton (SS-201) underway, circa 1941, with another submarine in the background. 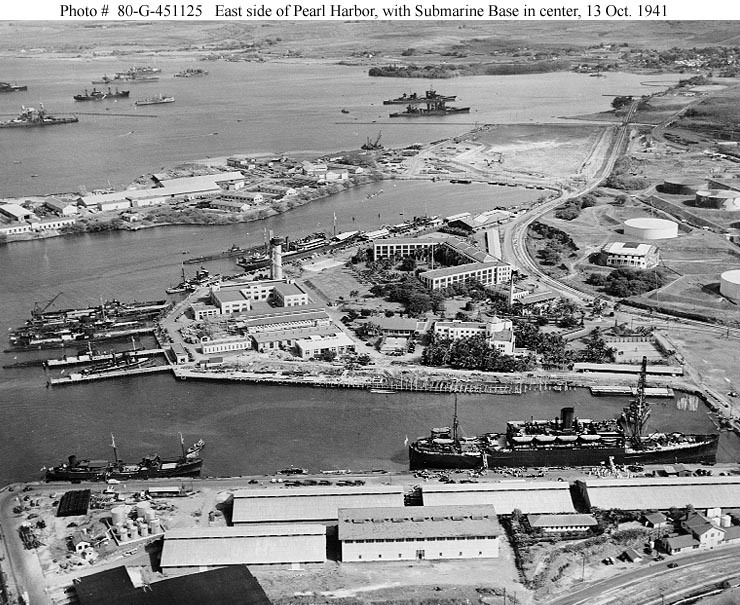 Probably taken with Trout (SS-202) and other submarines, when they conducted training operations with Submarine Division 62 until 29 November 1941 when she stood out of Pearl Harbor to conduct a simulated war patrol off northern Midway. Official USN photo # NH 99279, from the collections of the Naval Historical Center. 17k Triton (SS-201) is shown in prewar configuration. A 0.50 caliber machine gun was set up forward of her bridge. The gun could not be permanently mounted, nor could it be located atop the bridge because of its interference with radio antennas. Submariners disliked this arrangement. It entailed delay, which meant that a submarine often could not defend herself against a surprise attack. Drawing by Jim Christley. 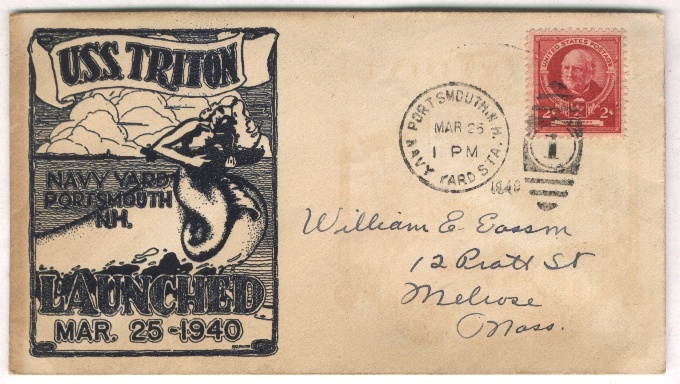 311k LCDR Charles Cochran Kirkpatrick was in command of the Triton (SS-201) from 31 March 1942 to 14 Feburary 1943. 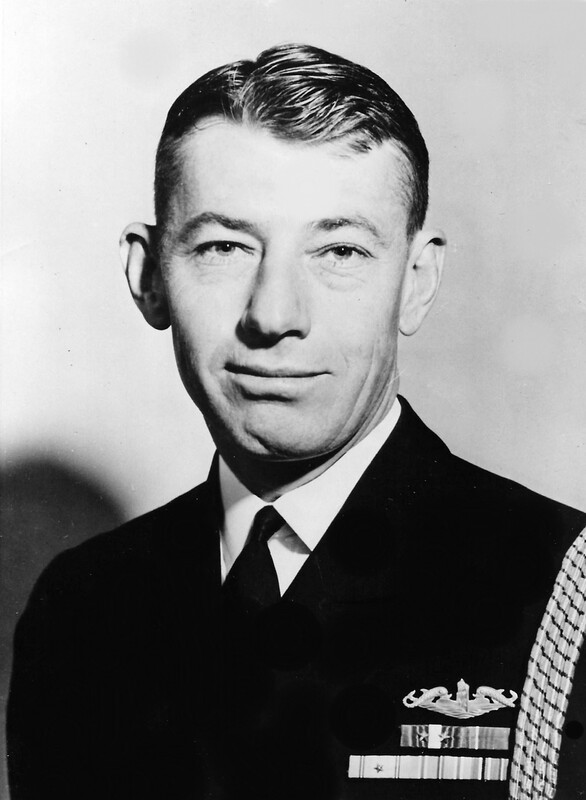 He was awarded the Navy Cross three times during his service aboard the Triton. He was credited with the sinking of eleven enemy vessels and other probable's unconfirmed. From the Army his was awarded the Distinguished Service Cross for action near Wewak, New Guinea, on 26 January 1943 for attacking a Japanese convoy apparently with the intention of landing supplies and reinforcing the enemy defenses in that area. While commanding officer of the Shea (DM-3), in action against enemy Japanese forces in the vicinity of Okinawa, on 4 May 1945 was awarded the Silver Star. USN photo courtesy of Bill Gonyo. 208k Triton's (SS-201) CO, Lt. 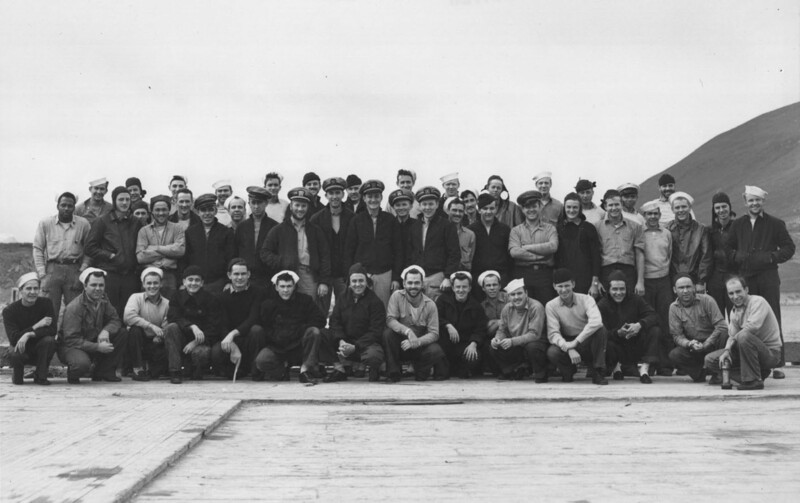 Commander Kirkpatrick & crew pose for a group photo on 16 July 1942 at Dutch Harbor, Alaska. Photo Source: NARA College Park, Maryland, Photo # 80-G-206171 courtesy of Tracy White @ Researcher @ Large. 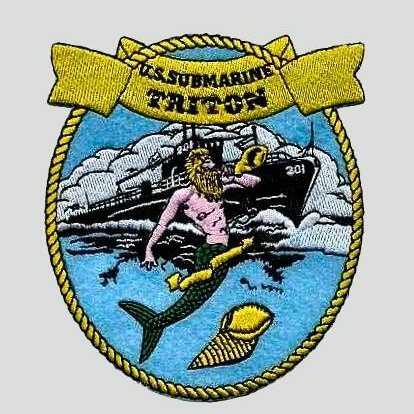 213k Triton's (SS-201) CO, Lt. 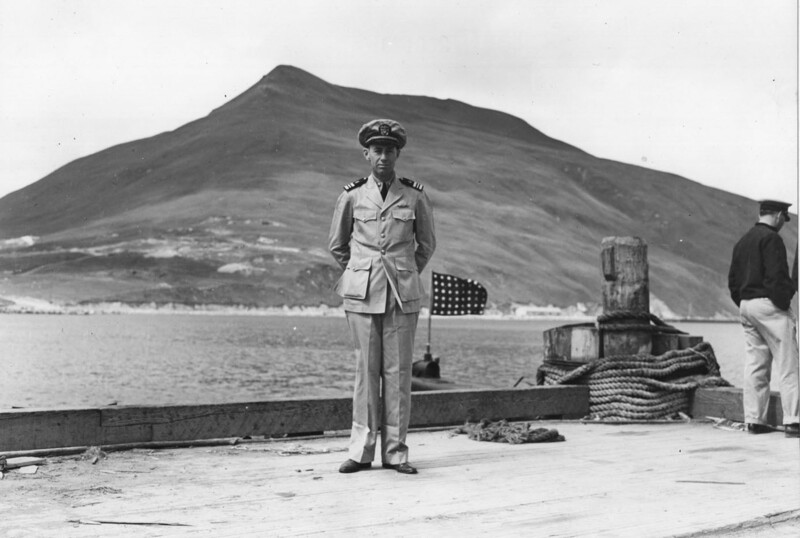 Commander Kirkpatrick, 16 July 1942 at Dutch Harbor, Alaska. Photo Source: NARA College Park, Maryland, Photo # 80-G-206173 courtesy of Tracy White @ Researcher @ Large. 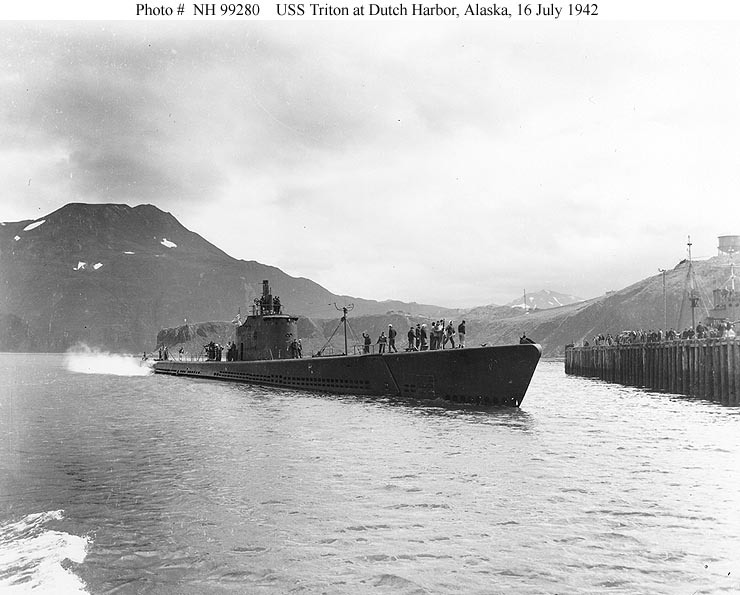 78k Triton (SS-201) at Dutch Harbor, Alaska, 16 July 1942. OfficialUSN photo from the collections of the Naval Historical Center. U.S. Naval Historical Center Photograph # NH 99280. 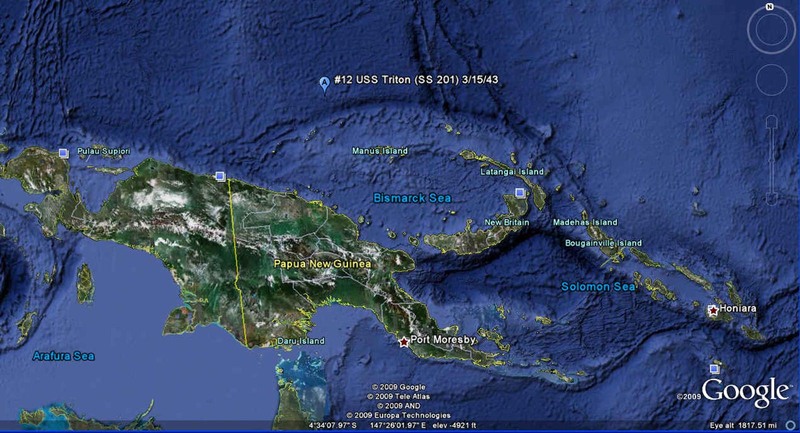 651k On 16 December 1942, Triton (SS-201) got underway for a position 20 miles east of Wake on the Midway-Wake route. 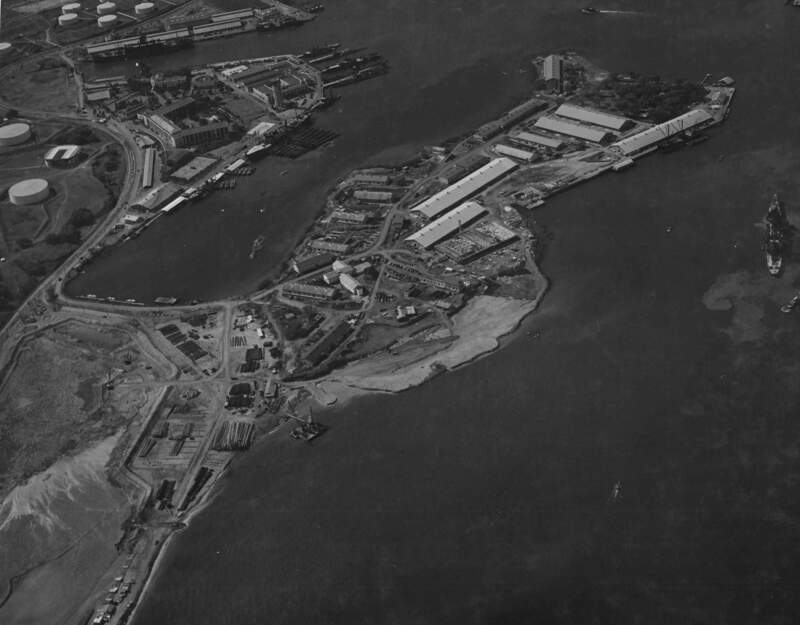 She was one of three submarines stationed between the two islands to mark the way for Army Liberator bombers in strikes on Wake and to rescue the crews of any planes forced down at sea. She made no rescues, but, on the night of 23 December, she aided in guiding the Liberators in a night bombing attack on the island. On Christmas Eve, the submarine sighted the mast of a ship on the horizon that was headed for Wake anchorage. Triton closed to 1,000 yards and fired two torpedoes. One hit under the stack and the other hit under the foremast. Amakasu Maru No.1 was obliterated in a cloud of smoke and steam as she went under. 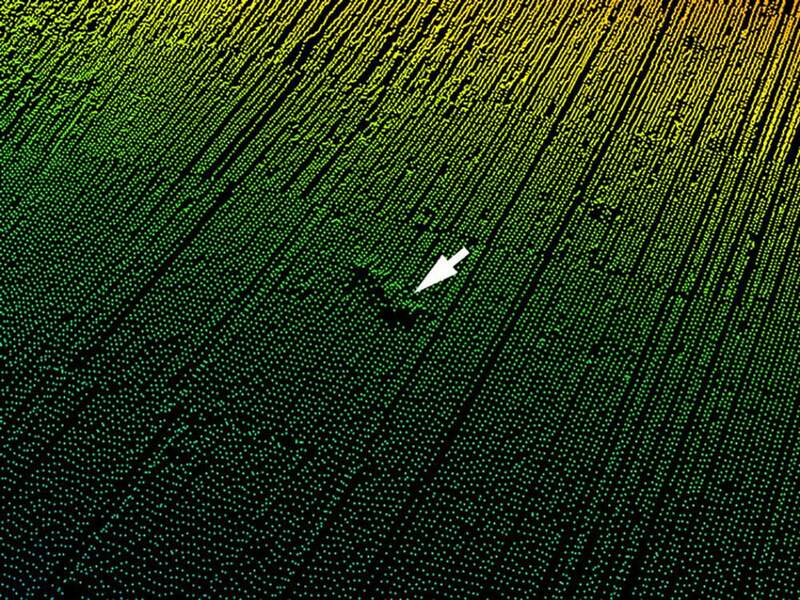 Raw multibeam point data of suspected wreck of Japanese destroyer Hayate. Further investigation with ROV Deep Discoverer confirmed it is Japanese cargo ship, Amakasu Maru No.1. 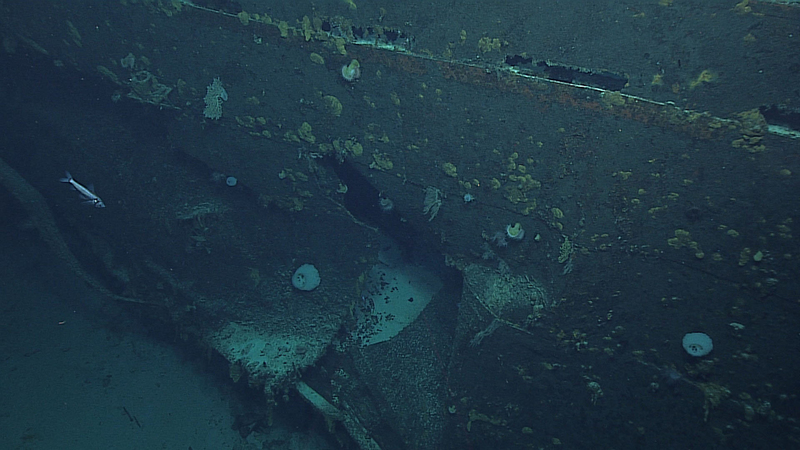 Considerable damage seen on the hull of the Amakasu Maru No.1 may be due to torpedoes fired by the American submarine, Triton. Text courtesy of DANFS & NOAA. Images courtesy of combinedfleet.com, Gary Fabian & the NOAA Office of Ocean Exploration and Research, Deepwater Wonders of Wake. 138k Color drawing of the Subchaser No. 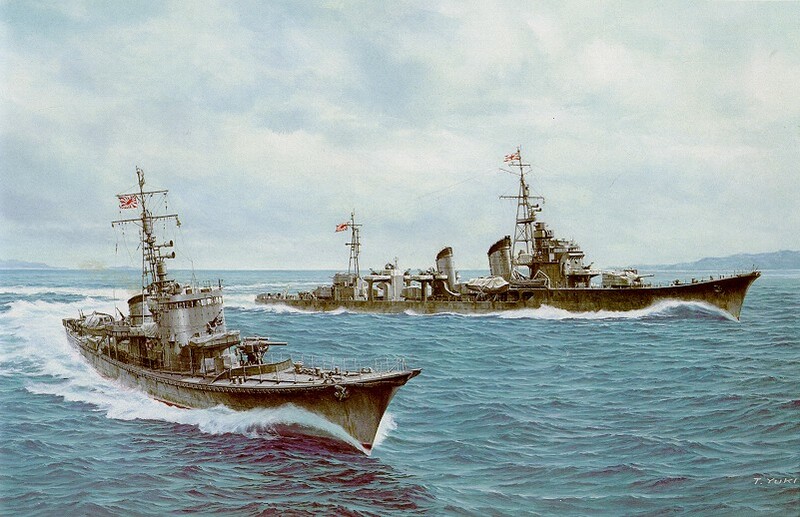 46 (left)(indicative of the class of submarine chaser which might have sunk the Triton (SS-201) and the destroyer Shimakaze (right) as depicted by Takeshi Yuki, "Color Paintings of Japanese Warships"). The Triton might very well have been sunk by the Japanese Mutsuki class destroyer Satsuki or Subchaser No. 24 north of Admiralty Islands, according to Submarines Lost Through Enemy Action Photo courtesy of combinedfleet.com. 53k Color print of the Japanese Mutsuki-class destroyer Satsuki which might very well have been sunk the Triton (SS-201) north of Admiralty Islands, according to Submarines Lost Through Enemy Action Photo courtesy of combinedfleet.com. 4k Map showing the area where the Triton (SS-201) torpedoed and sank the Japanese transport ship Kiriha Maru (3057 BRT) and torpedoes and damages the Japanese merchant Mito Maru (7061 BRT) some 145 miles northwest of the Admiralty Islands in position 00.37N, 145.30E. Triton reports this "kill" on 11 March but she is never heard from again. Photo & text courtesy of Great Circle Mapper - � Karl L Swartz / uboat.net. 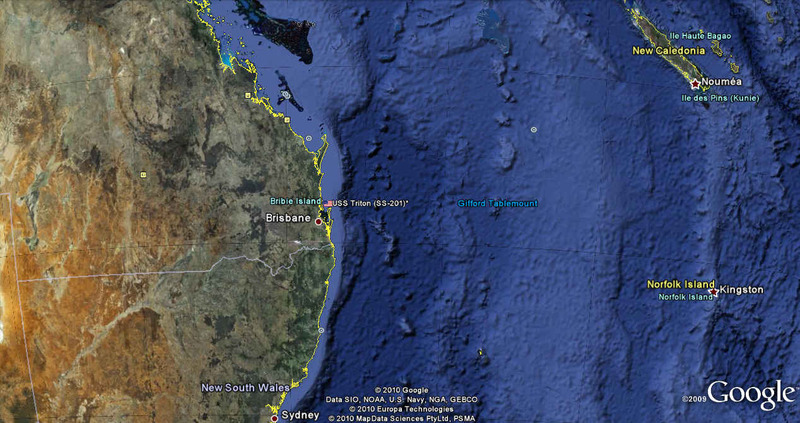 79k Google Earth satellite photo of the general area in which Triton (SS-201) is assumed to have been lost. View courtesy of Google Earth. 107k Another theory on the loss of the Triton (SS-201) suggests that it may have been sunk by "friendly fire" in the Brisbane River or somewhere near Brisbane between 27 and 29th March 1943. If so, this is a Google Earth satellite photo of the general area in which Triton's last approximate position based during post-war debriefings. View courtesy of Google Earth. 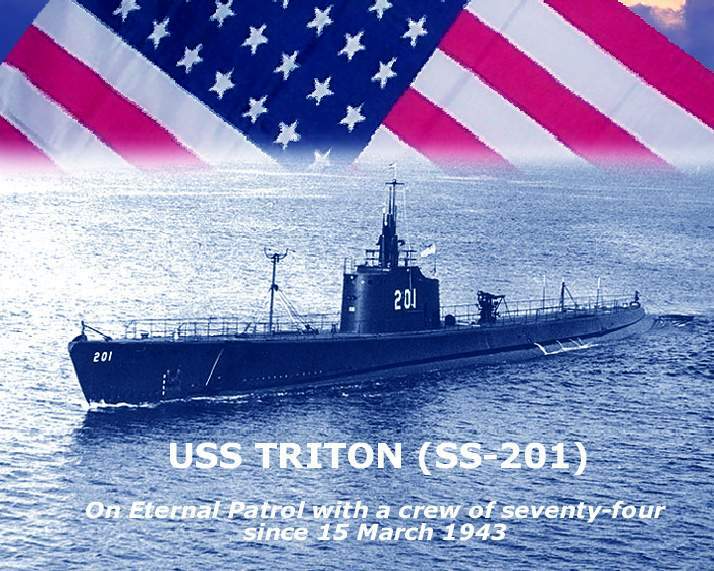 84k Commemorative photo in honor of the memory of the crew of the Triton (SS-201). Photo courtesy of Tom Kermen. Dante's Prayer courtesy of Loreena McKennitt via quinlanroad.com. 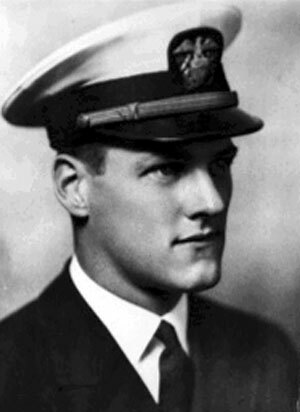 18k George Kenneth Mackenzie, Jr., Lieutenant Commander (Commanding Officer) of the Triton (SS-201) at the time of her loss. USN photo courtesy of oneternalpatrol.com. This air view of the lost Triton (SS-201) was made shortly after the modern submarine was commissioned in 1940. After sinking 11 Jap warships and merchantmen, she has failed to return and is presumed lost. She carried 60 officers and men. Image and text provided by University of North Carolina at Chapel Hill Library, Chapel Hill, NC. Photo & text by The Wilmington Morning Star. (Wilmington, N.C.) 1909-1990, 30 July 1943, FINAL EDITION, Image 12, courtesy of chroniclingamerica.loc.gov. 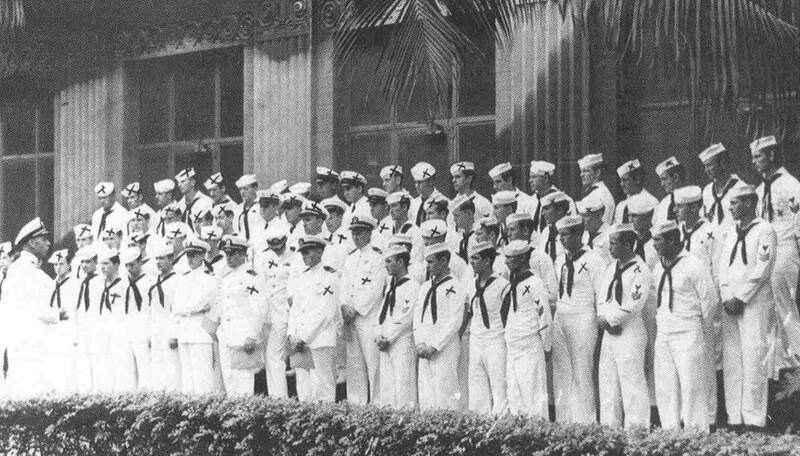 Crew photo of the Triton (SS-201), possibly after returning to Pearl Harbor on 7 September. 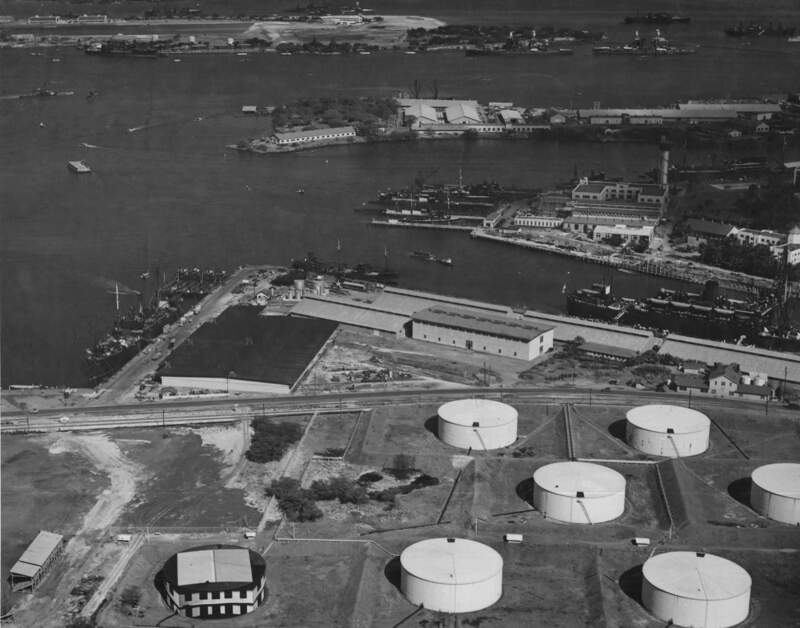 She then entered the navy yard for an overhaul that lasted until 6 December 1942. Those individuals marked with Xs might well be those who perished with her on her last patrol. "When the waves of death compassed me / the floods of ungodly men made me afraid; / the bonds of She'ol encircled me; / the snares of death took me by surprise; / in my distress I called upon the Lord, / and cried to my G-D: / and he heard my voice out of his temple, / and my cry entered into his ears. / Then the earth shook and trembled; /the foundations of heaven moved / and shook because of his anger /...the heavy mass of waters, and thick clouds of the skies /... And the channels of the sea appeared, / the foundations of the world were laid bare, / at the rebuking of the Lord, at the blast at the breath of his nostrils. / He sent from above, he took me; / he drew me out of many waters; / he delivered me from my strong enemy, and from those who hated me; for they were too strong for me. / They surprised me in the day of my calamity: / but the Lord was my stay / He brought me forth also into a large place: / he delivered me because he delighted in me./" USN photo courtesy of Scott Koen & ussnewyork.com. American Submrine SS-201 Triton, was it sunk by friendly fire?